Mary (Ramirez) Terronez was born in San Luis Potosi, Mexico to Dionisio and Adelaida Ramirez. She was four years old when her father was recruited by the Rock Island Lines Railroad to come and work in the Quad-Cities. They settled in Cook's Point, a barrio in southwest Davenport. Mary grew up with her 10 brothers and sisters and attended Davenport schools. At that time she completed the sixth grade. In 1936 Mary married Don Felipe (Bravo) Terronez, a union that forged the Iowa Mexican community with the Illinois Mexican community. Mary is the mother of Virginia, John, Phyllis, Irene, Georgia, and Randolph Dionisio. During the 1940's Mary negotiated wages and working conditions between barrio onion toppers and Pleasant Valley growers. In the late 1940's she was one of the few Mexican females to work outside the home. From 1940's into 1950's Mary performed community service activities between Cook's Point barrio residents and city officials, health department, school administrators, police department and business representatives. 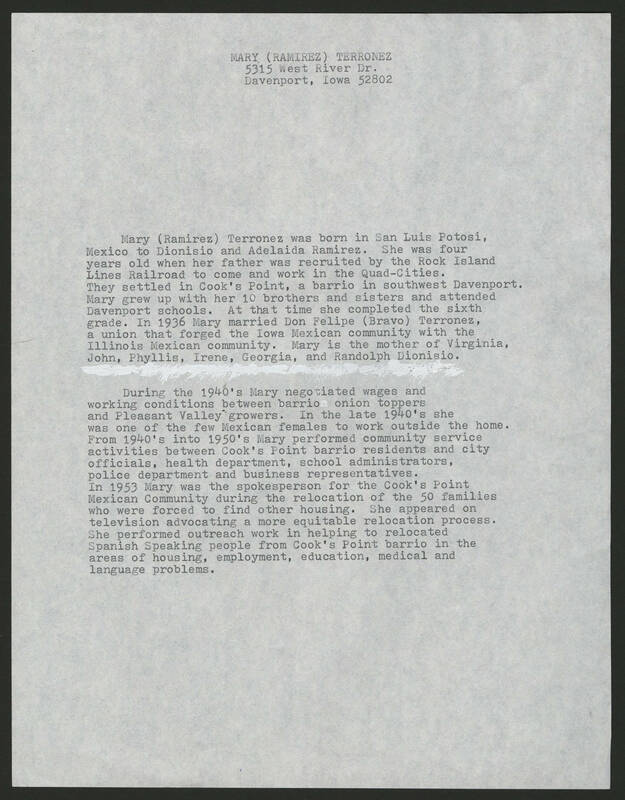 In 1953 Mary was the spokesperson for the Cook's Point Mexican Community during the relocation of the 50 families who were forced to find other housing. She appeared on television advocating a more equitable relocation process. She performed outreach work in helping to relocated Spanish Speaking people from Cook's Point barrio in the areas of housing, employment, education, medical and language problems.